Home > Blog > How does that make you feel? No matter what you’re feeling—happy, love struck, nervous, crazy—you can communicate your emotions with Emoticon or Emoji faces. In fact, they can often convey thoughts, moods, and attitudes with much more ease than it is trying to articulate our wide array of feelings with words! They may owe their existence to social media and texting communications, but we’ve invited these communicative buddies of ours to come over, hang out, and adorn some of our most emotive products like the Emoticon Activity Book from iScream! Read on to check ‘em all out! We have a handful of Emoji Pillows on which to rest your head. Have your pick or collect them all! We’ve got a two-faced Emoji Pillow that changes moods with a simple flip. 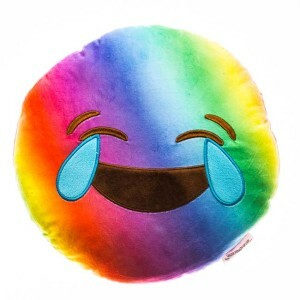 We have a Smiley Tie-Dye guy for a fun camp companion as well as a plushy piece of poo for you and your friends bathroom humor. 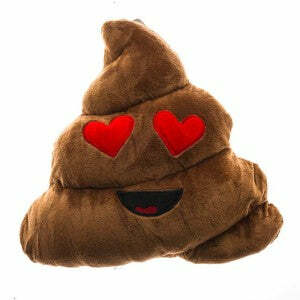 You can else get a groovy grumpy with our Tie-Dye Poo Pillow. When it comes to Emojis, we just can’t help ourselves. 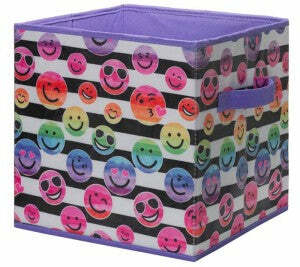 The Three Cheers for Girls Folding Storage Cube saves you valuable space and the cute Emojis put a smile on your face. It folds up as easily as it pops out to give you ample storage space. 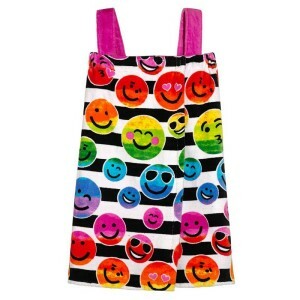 We also offer their smiley Spa Wrap and Emoji Shower Caddy. Three Cheers even has Emoji Stationery! I saved the best for last on purpose. Our Emoji Designer Trunk is five panels of happy, love struck, nervous, crazy, zany, and a variety of other Emoji faces. Often able to convey with ease what may be difficult to articulate in words, Emojis are more than just easy ways to express ourselves—these guys are our buddies, reflecting ourselves in their communicative faces. We threw an Emoji party with this Designer Trunk! 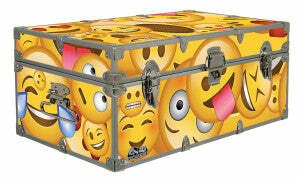 Embrace your Emojis and check out this expressive camp trunk! Wearing their hearts on their sleeves, these products wouldn’t have it any other way. Go ahead and share your feelings when you shop our Emoji products and, as always, thanks for reading.